Semi-autonomous driving is an interesting experience, no matter how you’re exposed to it. If a set of training wheels is something you’d consider, Nissan’s ProPilot Assist requires you to hold its hand throughout the drive. In the hands-on I did with a prototype version last summer, I felt Nissan’s semi-autonomous mode was a way to play two sides at once. ProPilot Assist could drive the car itself, but never fully allow drivers to be complacent. That should be par for the course when driving anyway, but now that it’s live, Nissan’s technology is also up against competitors already in the market. I got to test it on a 2018 Nissan Rogue SL Platinum (the trim with ProPilot Assist included) and finally got to see how it performs on roads in and out of the Greater Toronto Area. Nissan has only made the mode available on two vehicles: the all-electric Leaf and the aforementioned Rogue SL Platinum. Not surprising, given one is the company’s only all-electric, while the other is Nissan’s top-selling model in Canada. For that Rogue trim, you’re looking at a starting price of $37,000. It’s officially a Level 2 autonomous driving technology because it can only drive the vehicle on its own under strict limitations. Like other systems, it’s layered on top of the adaptive cruise control and lane guidance features Nissan already deployed in the past. However, competing systems — like GM’s Super Cruise, for instance — ProPilot Assist doesn’t rely on GPS to stay on track. Nissan made it a little less complicated by only combining a forward-facing camera with radar. Embedded software helps to coordinate these pieces to maintain consistency in staying within the lines. The mode technically works on any road with two distinguishable lines making up the lane, but is best suited for highways. It can only engage when travelling above 32km/h and maxes out at about 145km/h. There was a sequence of button pushes I needed to master before I could engage the system without second thought. The steering wheel has a dedicated blue button representing ProPilot Assist. Pressing that alone doesn’t do anything. The next step was to turn on the Intelligent Cruise Control, set the desired max speed and then the safety distance. 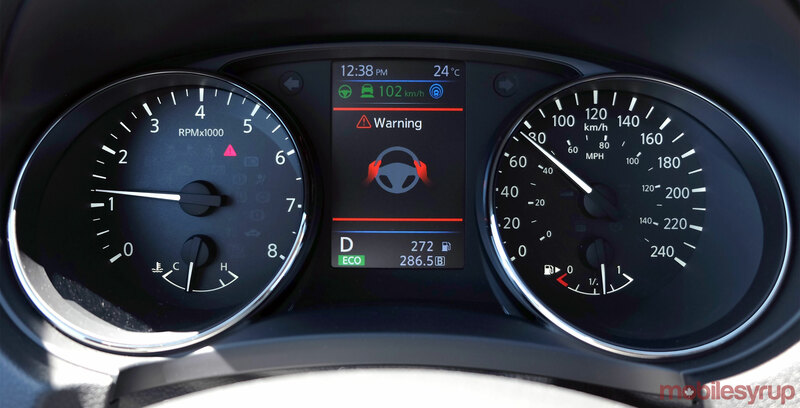 Visual indicators on the digital cluster in front of the wheel were good at confirming the steps. The ‘Cruise’ icon and speed were obvious, and when the steering wheel icon turned green, ProPilot Assist was fully engaged. Despite the autonomy in motion, a torque sensor in the wheel itself requires at least one hand maintain contact. Being Level 2 technology, ProPilot Assist can’t change lanes on its own. It will, however, re-engage after the driver manually switches into the next lane. Throughout, the adaptive cruise control applied, meaning the Rogue would speed up or slow down in accordance with the distance I set. It even did stop-and-go traffic. Only applying the brake or pressing the button on the steering wheel turned it off. While it could technically work in an urban city or town environment, the system doesn’t recognize intersections, traffic lights or pedestrians, so only the longest boulevards would make any sense in using it. GM’s Super Cruise has the ability to drive smoothly and dynamically on the highway without anything touching the steering wheel. Even with my index finger and thumb just hanging off the wheel on the Rogue, I never felt the same level of comfort. Part of that is simply a difference in the mechanics of the respective vehicles. A Cadillac CT6 should always drive smoother than a Rogue, especially when it’s well over double the price. But there were some other particulars I noted. Since Super Cruise partially relies on GPS mapping, it knows when a bend is coming up and adjusts speed to navigate it. ProPilot Assist can only follow the lines, so it can’t know how tight a bend is until it’s already driving on it. For that reason, drivers have to be prepared to assist in steering. I certainly had to, and there were even a few instances where I had to do it on straight lines as well. Weather conditions also played a factor. Engaging the windshield wipers suspended the system at the higher settings. If it was a slight drizzle, and I kept them at a more intermittent interval, the system could still work. It always depends on whether it can plainly see the lines or not. Rain at night will obscure the vision, limiting the system’s availability. Snowstorms and dirt roads are non-starters. Still, it was a joy to just let the Rogue drive on longer stretches barely handling the wheel. It wasn’t quite as relaxing as Super Cruise, but it didn’t feel like a chore to use, especially after mastering the sequence to engage it. There were some interesting nuances I caught on to while testing this. ProPilot Assist was astute enough to veer me over to an offramp on the highway, regardless if I wanted to or not. Where Super Cruise needed manual override for construction zones, ProPilot Assist waded through them, so long as there were clear lines painted on the road. Going straight parallel to an on ramp also required attention because adaptive cruise control (on any car, really) can’t recognize another car unless it’s directly in front. No matter what, learning to trust such a system takes time. Semi-autonomous, as it may be, drivers are still ultimately responsible for whatever happens. ProPilot Assist has no way of communicating with an overhead network, much less other vehicles on the road, so its heavily dependent on human decision-making. It’s always nice to properly test a semi-autonomous driving mode in real-world conditions after seeing it first as a pre-production technology. ProPilot Assist has a limited rollout for now, but it’s likely to be part of Nissan’s lineup moving forward. For the moment, it’s a luxury feature, albeit one that needs some work to feel like it’s a big step into the future. No doubt Nissan will improve it going into 2019, but for now, only the earliest adopters may feel the need to embrace the automaker’s semi-autonomous mode.